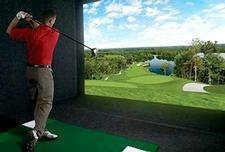 Golf Simulation $40 18 Holes of Simulated Golf for a Foursome (Reg $160, Approx. 4 Hours of Time)) - $40.00 - GolfersEdgeOnline.com - Best Golf Equipment On The Web! Whether you're just learning the game or preparing for the PGA tour, our simulator will make you a better golfer! You can bring in your own Food and enjoy yourselves with Friends playing golf indoors this Winter Season! Bring your foursome and enjoy state-of-the-art simulated golf! Step into our simulator and play some of the most famous courses from around the world including Pebble Beach, Saint Andrews and Torrey Pines. If you have any more questions about the Golf Simulation $40 18 Holes of Simulated Golf for a Foursome (Reg $160, Approx. 4 Hours of Time)); do not see the model you are looking for; need custom options; or prefer to not purchase online, then please call us at (630) 656-1291.